In publishing my journal of an archaeological tour in Indian Tibet, undertaken on behalf of the India Government, I wish in the first place to express my sincere thanks to Dr. J.H. Marshall, C.I.E., Director-General of Archaeology, who made all necessary arrangements in connection with my deputation-no slight addition to the already heavy burden of his office and who has followed my journey with keenest interest. As in the spring of 1910 he went home on long leave, Dr. J. Ph. Vogel, while officiating for him, undertook to arrange for the publication my materials. His proposals met with the approval of the Government of India in the Education Department, and bit was decided that my report should consist of two volumes both fully illustrated : the first containing a personal narrative of my journey and the second dealing with the historical chronicles and inscriptions collected in the course of my tour. It is a matter of no small satisfaction that, thanks to the liberality of the Indian Government, my results will be made available in so excellent a form. Dr. Vogel’s thorough revision of the whole text has in many ways greatly added to the value of the publication. To Mr. H. Hargreaves, Acting Superintendent in the Archaeological Department, I am indebted for assistance in verifying references and preparing a map to illustrate my itinerary. Here I wish also to record my sincerest thanks to the following ladies and gentlemen who have been good enough to read through my first rough manuscript of the journal :-to Dr. John Hutchi-son of the Church of Scotland Mission in Chamba ; to Mrs. S. A. Becker-Chapman of Herrnhut ; and to Messrs. J. E. Wilkinson and J. Thom of Simla. I owe my gratitude also to the Public Works Department for placing their resthouses in the Satluj Valley at my disposal. 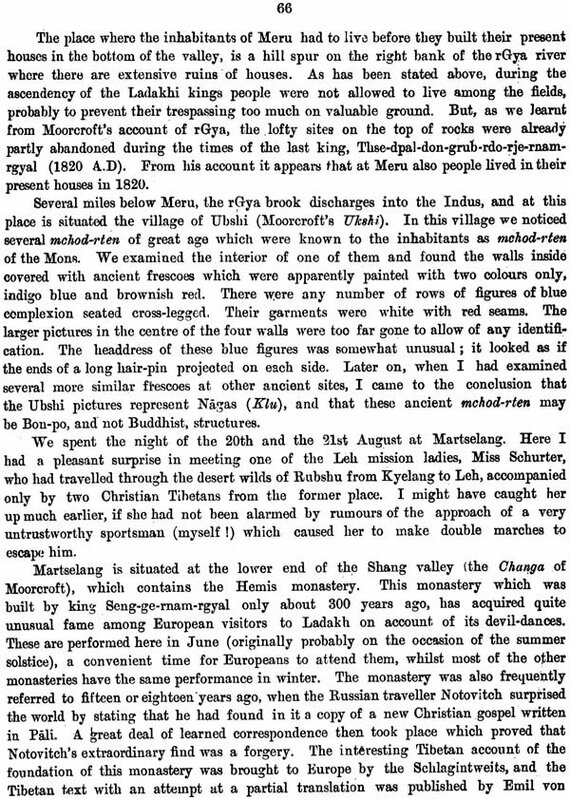 At Poo and Leh I was the guest of the Moravian Missionaries who did their utmost to assist me in my work. Of the greatest importance was my meeting Mr. G.C. L. Howell of the Indian Civil Service in Spiti, at a time when I was suffering from illness. His hospitality, knowledge of local conditions and ready help were of the greatest possible assistance in furthering my undertaking. Towards the end of April 1909, I received a telegram from the Indian Government asking me to enter their archaeological service for a period of eighteen months, from the Ist June of that year. 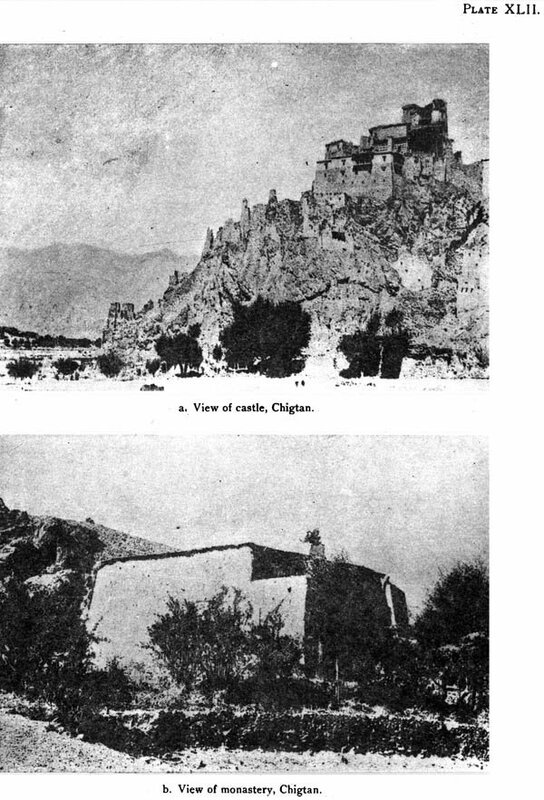 I arrived in Simla on the 30th May and from the Ist to the 14th June, Dr. J. H. Marshall, C.I.E., .Director-General of Archaeology, sacrificed a great deal of his time in drawing up a plan for my journey and discussing with me various matters connected therewith. Thanks to his energy, all preparations were finished on the 12th June, and on Monday the 14th June, our caravan started for the frontier districts. 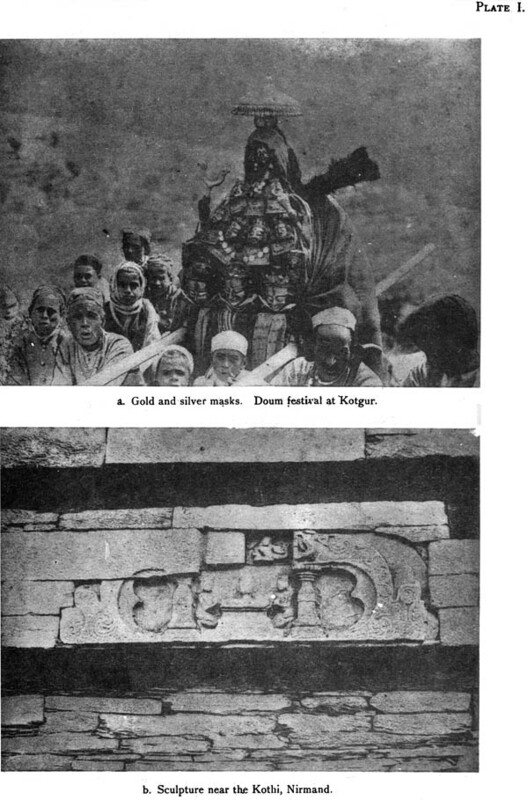 As regards our plans, it was determined to cover as much ground as possible and to spent a considerable portion of the summer months within the limits of the Jammu and Kashmir State, For with its territory are known to exist several interesting relics of Tibetan antiquity which have not yet been properly examined. Putting aside the ordinary routes, the Kashmir State can be entered from two parts of Indian Tibet, from Lahul and from Spiti. 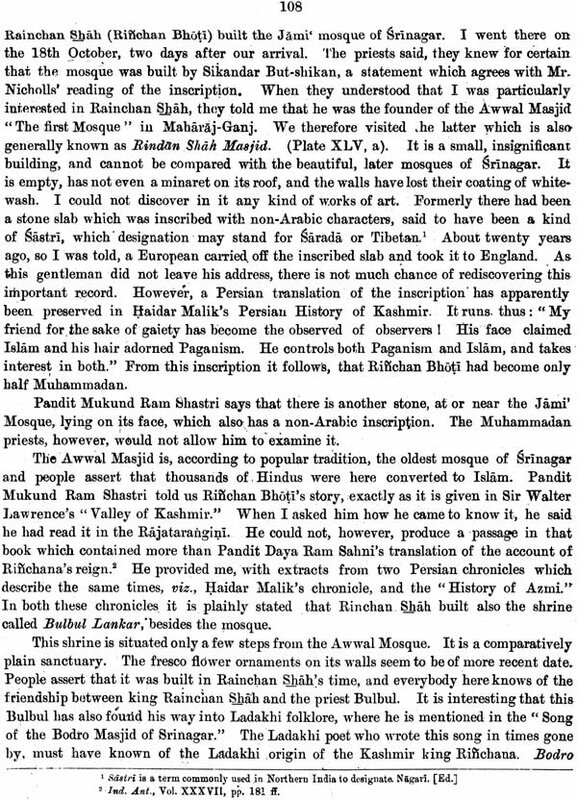 As Lahul had already been investigated by Dr. Vogel, the course to be taken by me was to enter the Kashmir State from the Spiti side. Spiti was one of the countries of Indian Tibet which I had not yet seen. As the road to Spiti took me high up in the Satluj valley, I proposed to pay a short visit to Tholing and Tsaparang beyond the frontier. These places interested me particularly on account of their connection with Atisa and d’Andrada. This proposal was, however, not sanctioned by the Supreme Government, and I was advised to remain within the Indian Frontier. 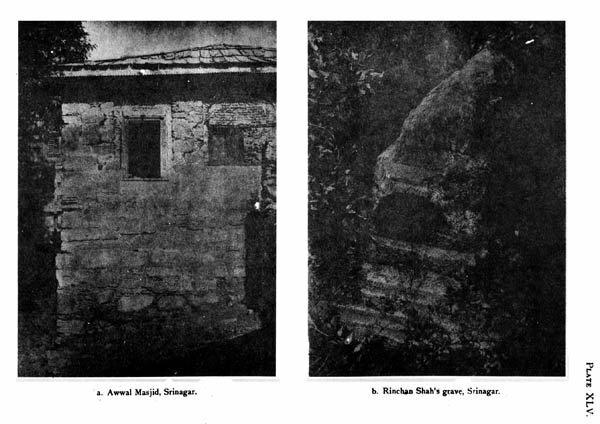 Our party was to consist of a Government Photographer, Babu Pindi Lal of the Archaeological Survey, who also knew how to take impressions of inscription, and a Khalasi who also knew how to take impressions of inscription, and a Khalasi who had to be engaged in the interior. In addition to these there were two men whom I engaged privately, a bearer and cook in one person, and a Tibetan who assisted me in the reading and copying of inscriptions and documents. Dr. Marshall was very fortunate in his choice of the photographer ; for in the case of an expedition like ours, an ordinary proficiency in photography would not have sufficed ; what was wanted was a man ready to endure hardship, and one who was prepared to carry on his work under adverse circumstances. Pindi Lal has amply justified Dr. Marshall in his choice. The printing of Dr. Francke’s work was commenced in 1913. It was practically suspended during the war years, and the difficult period which followed : and since its resumption in 1920 it has been retarded type and the author’s residence in Germany, entailing a vast amount of correspondence. The work has undergone considerable revision both prior to being submitted to the press and subsequently. As regards the difficulties of the texts, it may be said that the edition and translation have been rendered possible only by Dr. Francke’s personal acquaintance with the language, peoples, and topography of Ladakh and the neighbouring territories, and by the help which he was able to obtain in the country itself. There remain many points of reading, rendering, and explanation in regard to which certainty has not been attained. In general Dr. Francke has preserved the varieties of spelling which he found in his originals, and such varieties are usually reflected in the translations. 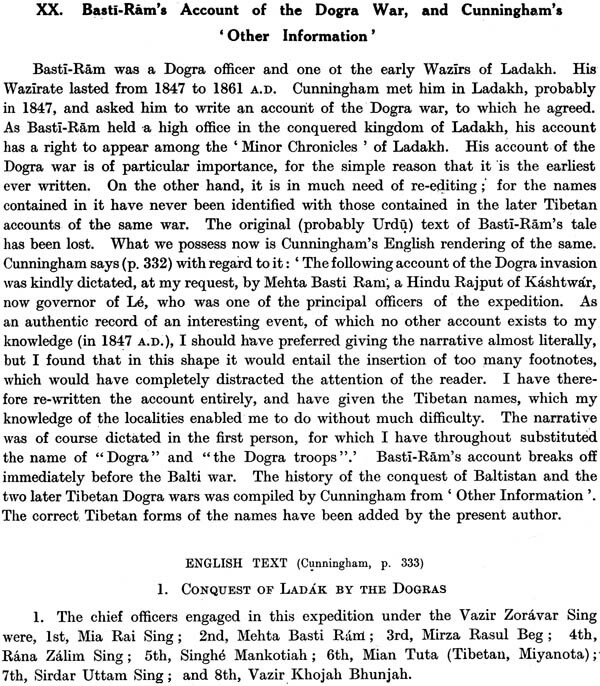 Apology must, however, be made for some inconsistencies in the treatment of Indian terms occurring in the Tibetan : thus such words as maharaja, wazir, may have been so written where the Tibetan has ma- ha-ra-dza, wa-zir. The numerous deviations in the spelling of the same names may be classified as follows : First, there are the variations so common in the Tibetan spelling both of proper names and of ordinary words. Secondly, there are the divergent spellings of European writer, whether due to differences of data, or to systems of transliteration, or to individual idiosyncrasies : and an important group under this head consists of place-names which have assumed a certain fixity in maps, while another consists of names of rulers for which Cunningham’s Ladak is the chief or sole authority. In general the principles followed have been (1) to preserve in all citations the spelling of the writer, (2) to maintain an uniform and, if possible, correct spelling wherever Dr. Francke is speaking in his own person, except that (3) licence has often has often been taken to refer to places under the name-forms familiar in the ordinary maps. In the special local maps prepared for this volume a correct orthography has been thought appropriate. 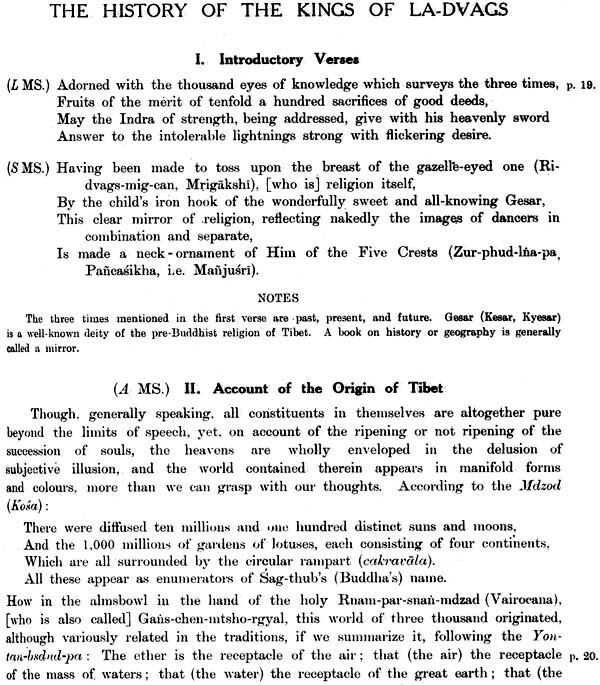 It is to be hoped that in the future writers on Tibet will show respect for an old literary language by presenting Tibetan words in the form of an exact transliteration according to an by presenting Tibetan words in the form of an exact transliteration according to an accepted system, regardless of pronunciation, which readers unacquainted with the language will in any case distort-in obedience, it would seem, to a perverse instinct misguiding all alike, whether docti or indocti, in the presence of unknown vocables. 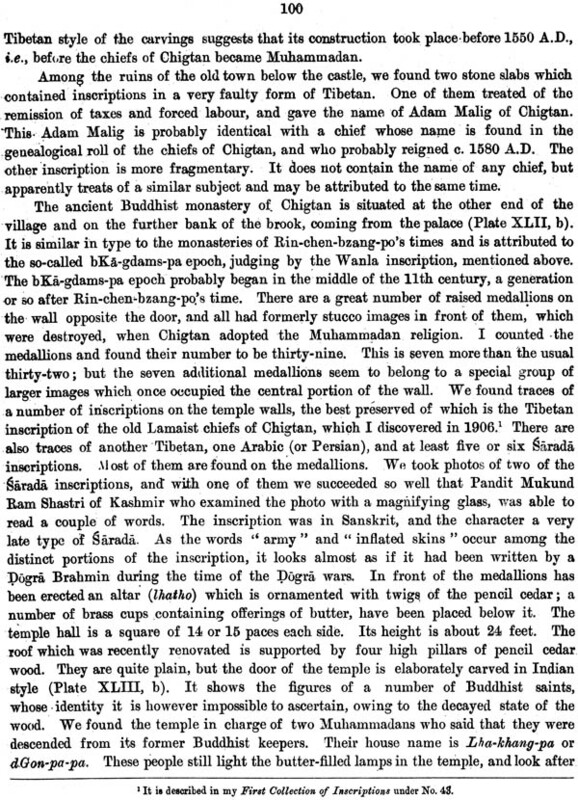 Prior to the appearance of Cunningham’s Ladak (London, 1854)-with which we should associate the likewise valuable work (Western Himalaya and Tibet, London, 1852) of his fellow-explorer, Dr. Thomas Thomson-information concerning Western Tibet was based almost exclusively upon the reports of travellers, Chinese travellers from the fourth to the ninth century A.D., Roman Catholic missionaries during the seventeenth and eighteenth, British travellers (Moorcroft, Henderson, Vigne) during the first part of the nineteenth. 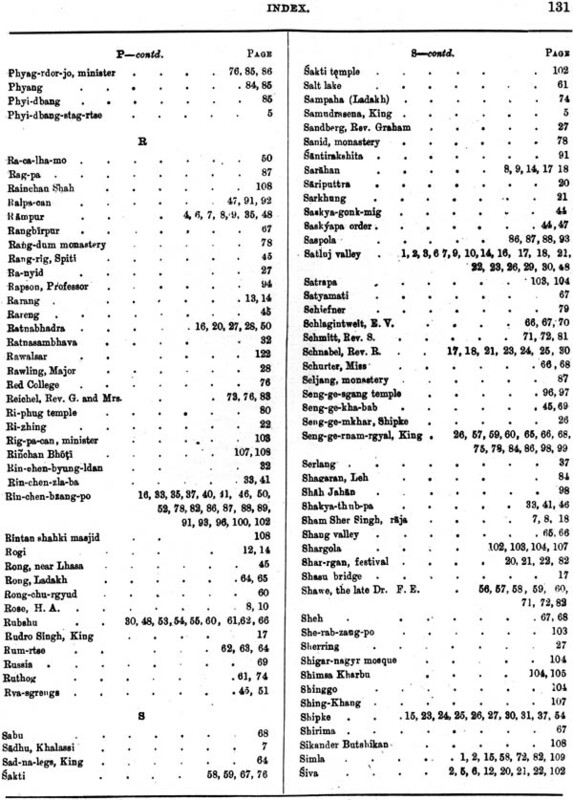 Some lists of kings were supplied by Csoma Corosi, who lived in the country from 1823 to 1830, in Prinsep’s Useful Tables, pp. 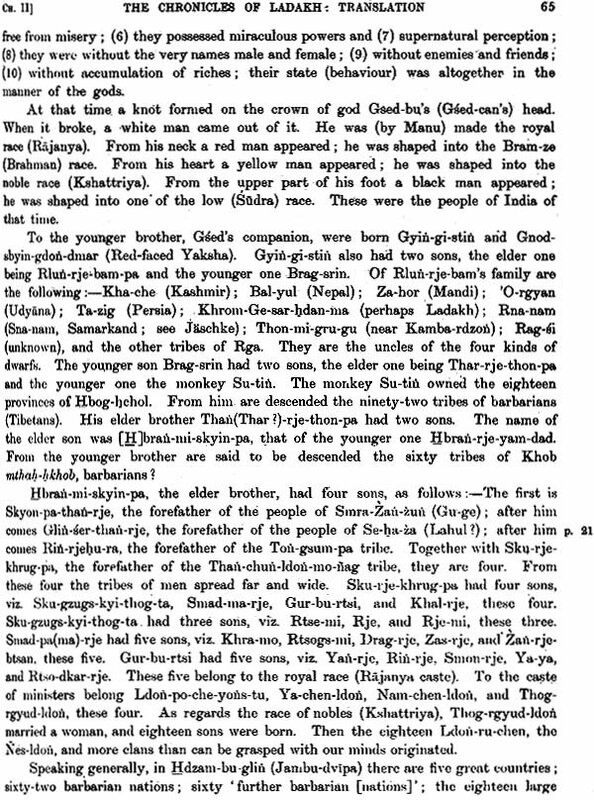 131-2 ; and a few isolated notices have been traced in the Sanskrit chronicles (Raja-tarangim) of Kashmir. Cunningham’s work was of great importance, furnishing not only a great deal of systematic information concerning the geography, topography, meteorology, and economics of the whole region, but also a description of the ethnology and common life, the government, the religion, the languages, and the history. He supplies genealogies of kings and successions of priests for the several districts, and details the substance of local chronicles and narratives. His remarkable historical and topographical insight enabled him to produce a work which is susceptible much more of amplification than of correction, and which will retain its value as an original source. Since his time the region has been extensively visited by officials, explorers, mountaineers, scientists, travellers, and sportsmen ; and Ladakh in particular has been found not beyond the reach of ordinary tourists. The most marked deficiency in our present knowledge of the whole territory affects its early history, which is not without importance, seeing that the trade route via Ladakh has from ancient times connected Kashmir and India with the life and politics of Central Asia. Dr. Francke’s work, providing definite outlines for the later centuries, may furnish threads leading back to the beginnings. The chronicles of Ladakh (La-dvags), which are here for the first time edited and translated in their full extent, comprise in their parts the history of the ancient empire of Great Tibet and in their more recent parts that of the West Tibetan empire. But even in the chapters dealing with the history of Great Tibet special attention is shown to Western Tibet ; and these chapters do not appear to be mere extracts from general Tibetan works of history. On the contrary, they appear to be an original production, which had its origin in the west of the country. 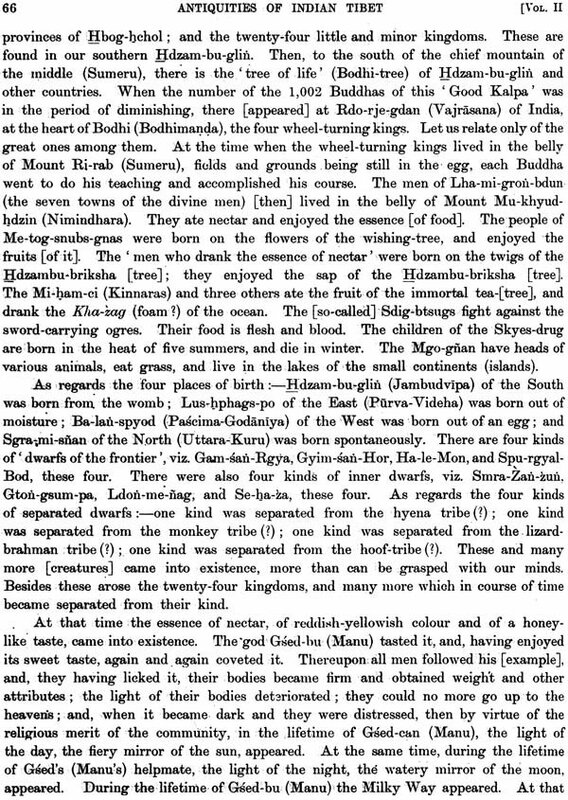 The first European to hear of the existence of a continuous historical narrative in Western Tibet was Csoma de Koros, who lived in Zans-dkar and Uppeer Kunawar between A. D. 1820 and 1830. 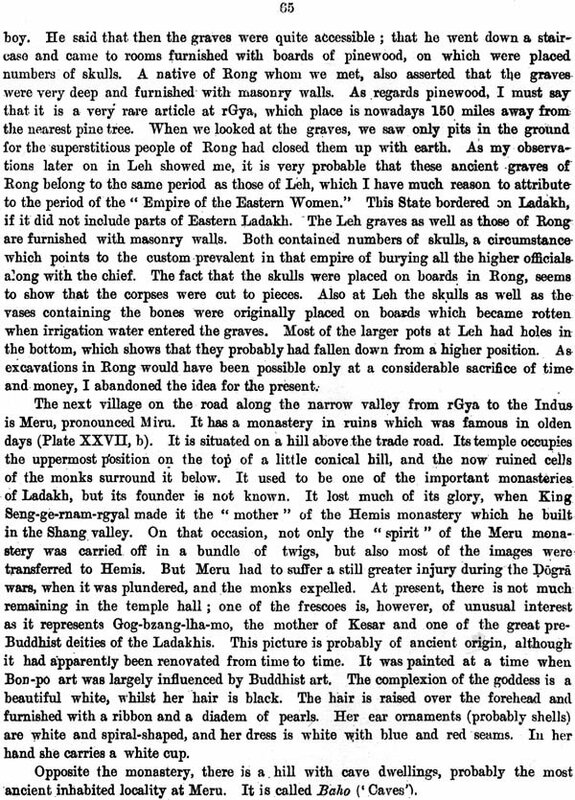 He says in a note appended to his list of Tibetan kings (Prinsep’s Useful Tables, p. 132) that there was a book at Leh containing the names of the kings who successively reigned in that principality (Ladakh). But Csoma was never able to see the book. 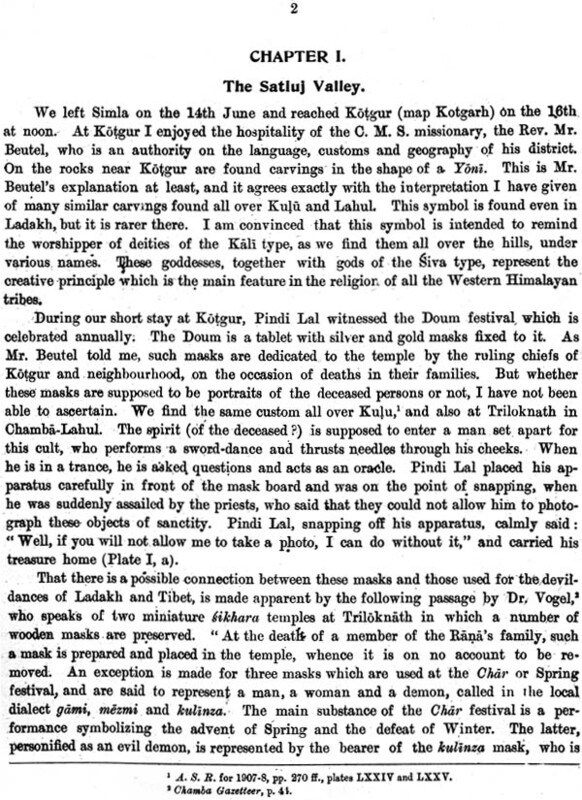 Csoma’s statement was question by sir Alexander Cunningham, who visited Ladakh in A.D. 1846-7. He says that from Dpal-gyi- mgon (tenth century) down to the end of the sixteenth century no historical records exist in Ladakh. This he explains following way :-‘During the invasion of Ladakh by Ali-Mir, the Mohamedan chief of Skardo (sixteenth century), all the temples and monasteries of the country are said have been destroyed, and their libraries thrown into the Indus.’ Cunningham, however, managed to see historical books containing the history of Ladakh from C. A.D. 1580 down to the Dogra wars (A.D. 1834). These chapters were apparently translated for him into Urdu, and he wrote down in English what he was told. This method explains a number of blunders found in Cunningham’s chapter ‘Under Native Rulers’. But a comparison of his account with that of the chronicles, as we have them now, plainly proves that his information was drawn from original documents. The first to bring a copy of such an original document to Europe was Hermann v. Schlagintweit, who visited Leh in 1856. It was a copy specially prepared for him, executed by three lamas, but not until valuable presents had been given to the ex-king. Hjigs-med-rnam-rgyal. This copy was published by Emil v. Schlagintweit, with a German translation, in Abhandlungen der kgl. bayerischen Akademie der Wissen schaften, vol. x, 1866. A copy of the La-dvags-rgyal-rabs, very similar to that of Schlagintweit, must have been in the hand of the Rev. H. A. Jaschke when he made his collections of Tibetan words for his Tibetan –English dictionary. Many of the words and passages marked Glr. 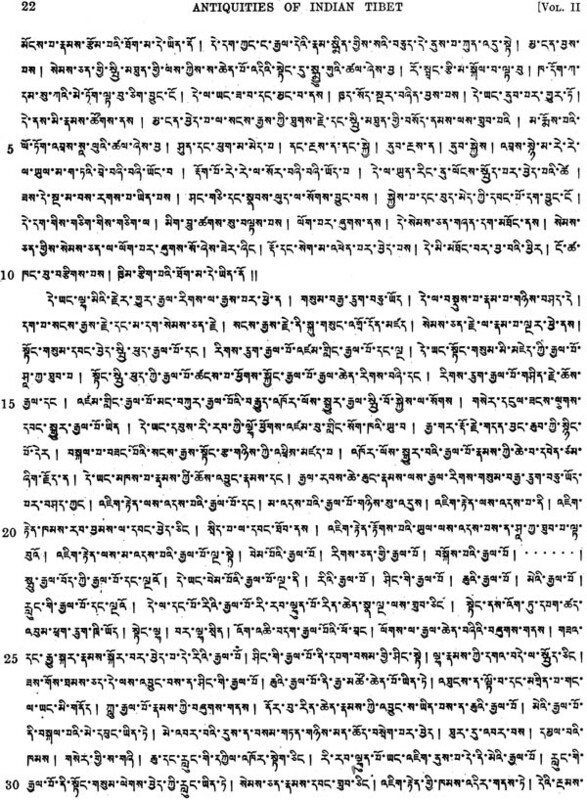 In his dictionary may be traced in the Tibetan text of Schlagintweit’s edition. But Jaschke’s rendering is often different from that of Schlagintweit. Dr. K. Marx, Moravian missionary at Leh, soon saw the insufficiency of Schlagintweit’s translation. At the same time he discovered at Leh two MSS. which contained fuller accounts of the times subsequent to A.D 1620. He even induced a Ladakhi nobleman, Munshi Dpal-rgyas, to write the story of the Dorga war, as such an account did not yet exist. Basing on this new material, Dr. Marx proposed to edit a history of Ladakh (of the West Tibetan empire, beginning with King Ni-ma-mgon in the tenth century) in three parts. The first part was to contain the history of Ladakh from Ni-ma-mgon to Sen-ge-rnam-rgyal (beginning of the seventeenth century) ; the Second part, the history from Bde-ldan-rnam- rgyal down to the Dogra wars (1834) ; and the third part, that of the Dogra wars. The first part of his work appeared in the J .A.S.B., 1891, consisting of text, translation, and notes, exactly as intended by the author, who had died a few weeks before its publication. 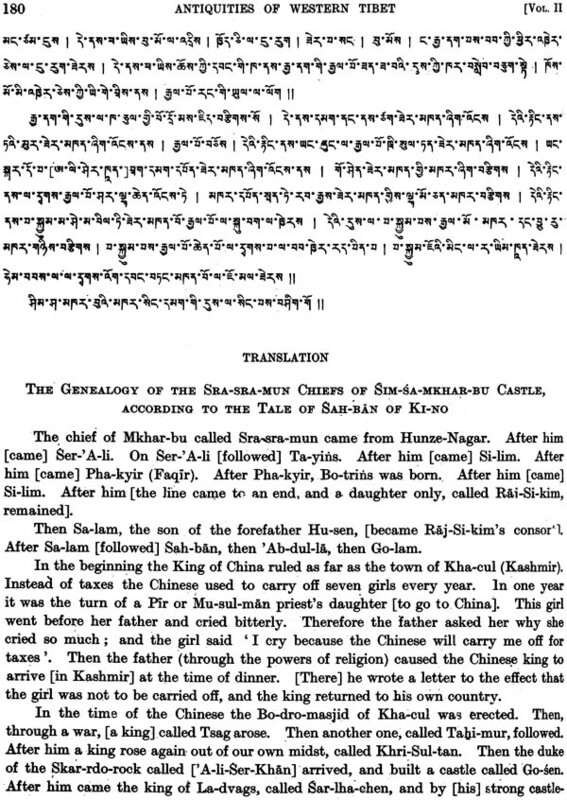 Of the second part, the Tibetan text being lost, an English translation only, with a few notes, was published by Dr. K. Marx’s brother, Professor G. Dalman. It appeared in the J .A.S.B., 1894. The third part, text according to Ca MS., With a translation by wife, sister-in-law to Dr. K. Marx, appeared in J .A.S.B., 1902. 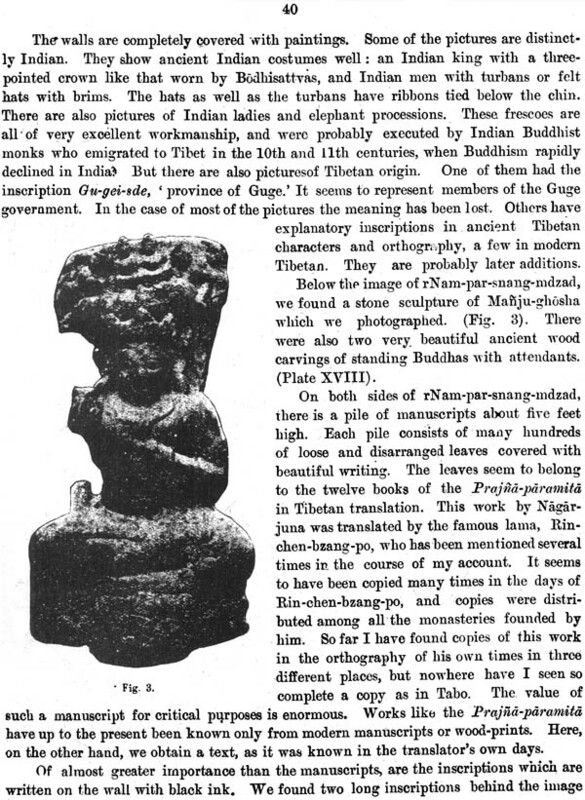 This was the state of things when Dr. Vogel, officiating Director-General of Archaeology in India, asked me to bring out a complete edition of the La-dvags-rgyal-rabs. In spite of all the labour spent on this little work the edition of the text, as well as its translation, had still many shortcomings. Not only was the text incomplete and scattered over various journals in two languages, but also the translation in many parts left much to be desired. My first aim was, naturally, to recover those MSS. which had been intended by Dr. Marx to serve as a basis for his second publication, viz. the history of Ladakh from C. A.D. 1620 to 1834. These MSS. Were called by Dr. Marx B MS. and C MS. Judging from the description which Dr. Marx gives of the author of C MS., I came to the conclusion that he might be Munshi Dpal-rgyas of Lah. My conjecture proved right, and the Rev. G. Reichel of Leh was soon enabled to send me a copy of C MS., covering that particular period of history. 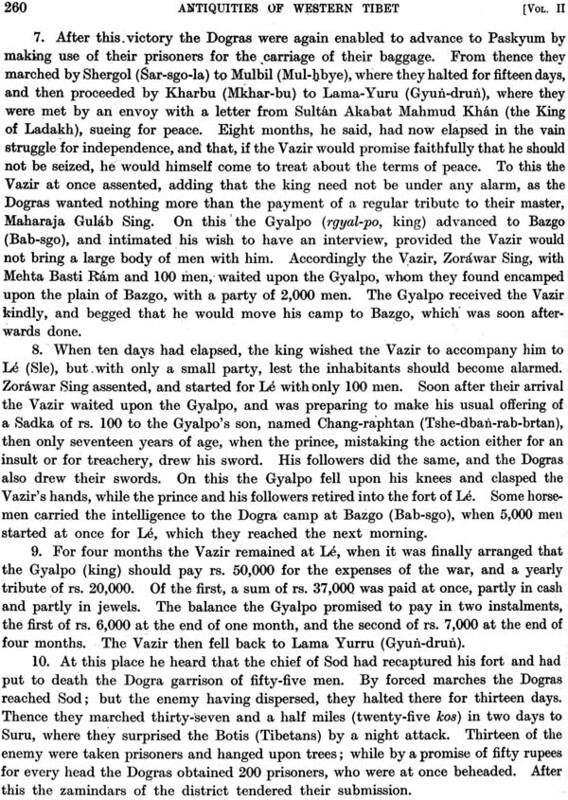 Munshi Dpal-rgyas, however, was not satisfied with furnishing this little chapter. On the contrary, he offered me in addition his most recent and most complete copy of his history of the Dogra wars. 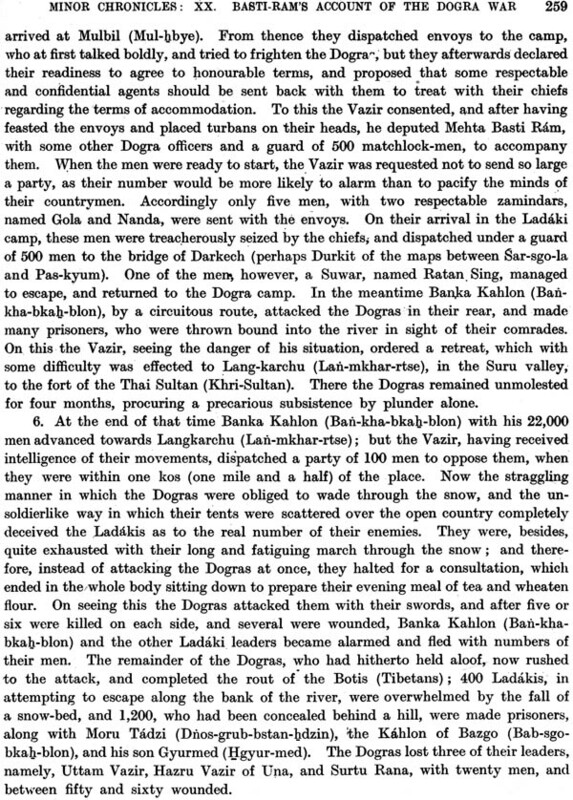 An examination of this new account of the Dogra wars showed me the advisability of embodying it in the La-dvags-rgyal-rabs. Not to miss the meaning of a number of difficult passages in that chapter. I translated it at once into German. 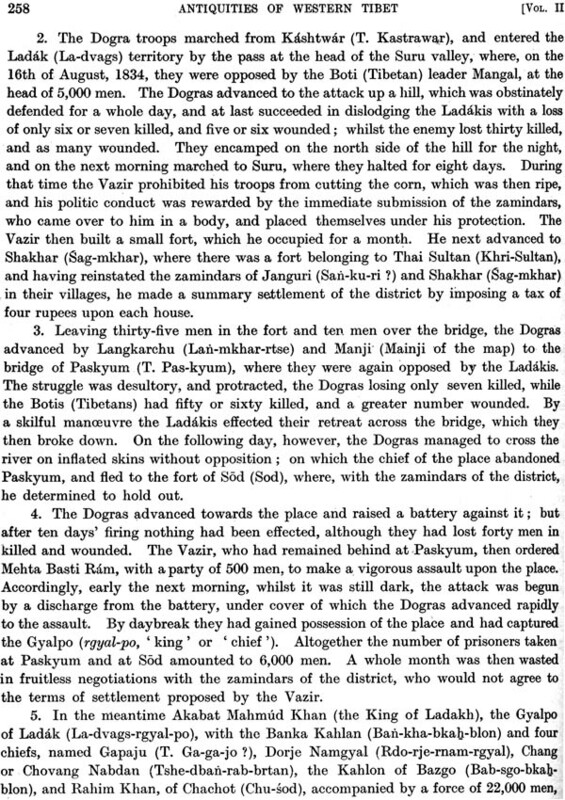 This German translation, together with a note on the relationship of the three different accounts of the Dogra war to one another, was published in the Z.D.M.G., vol. lxiv. All these different versions seem to come from Munshi Dpal-rgyas. It was more difficult to trace Dr. K. Marx’s B MS. As a description of the person who owned it about twenty years ago had not been left by Dr. K. Marx, I tried to recover it by offering a prize to the person who person who should find it. The prize, amounting to 10 Rs. only, was gained by the Christian schoolmaster at Leh, Joseph Tshe-brtan, who found the MS. in the possession of Tsandan-munshi at Leh. Of this MS. Joseph Tshe-brtan soon sent me a care me a careful copy. Then I remembered having read in Dr. K. Marx’s introduction that in several MSS. 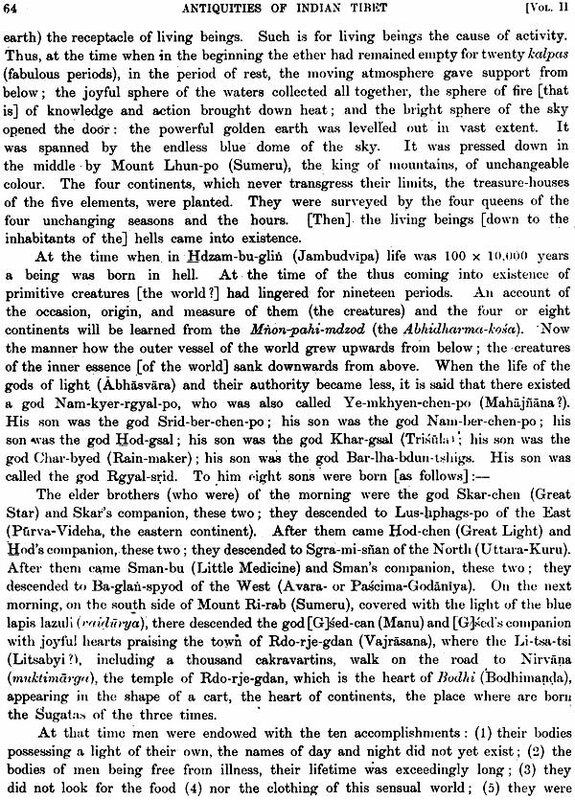 of the Rgyal-rabs a chapter on cosmology and cosmogony preceded the historical account of the chronicles. At the same time people told me of Munshi Dpal-rgyas’ most recent historcial activity, viz. 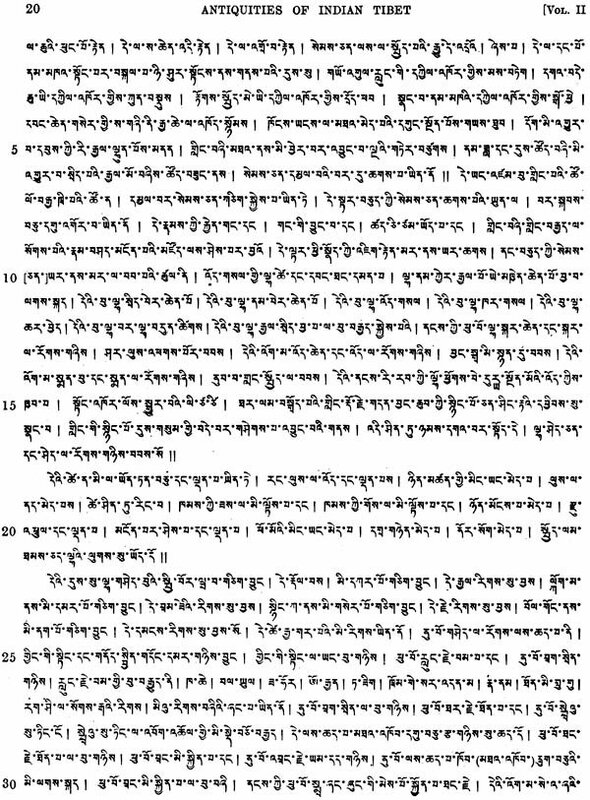 his composition of a chapter on the history of Ladakh after 1842 A.D. Joseph Tshe-brtan provided me copies of all these productions, to which he added quite a new chapter, viz. 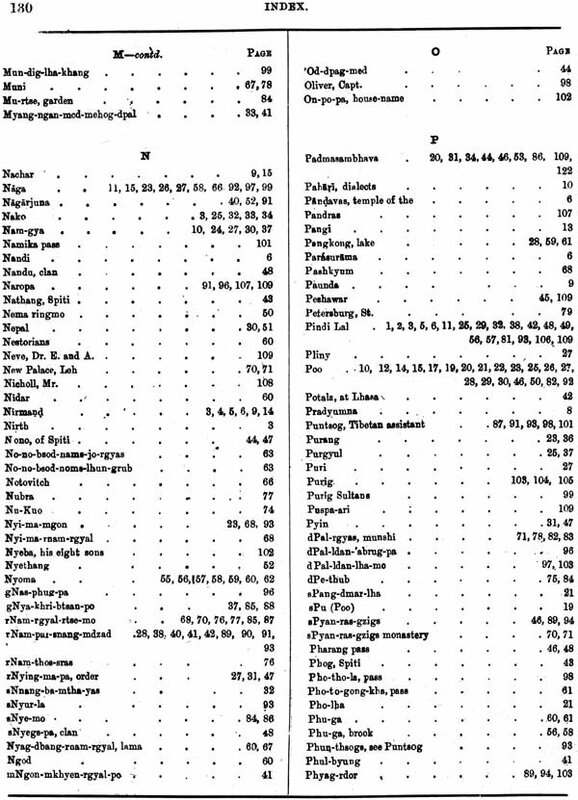 Munshi Dpal-rgyas’ chronological and taxation tables. When I heard from Dr .L. 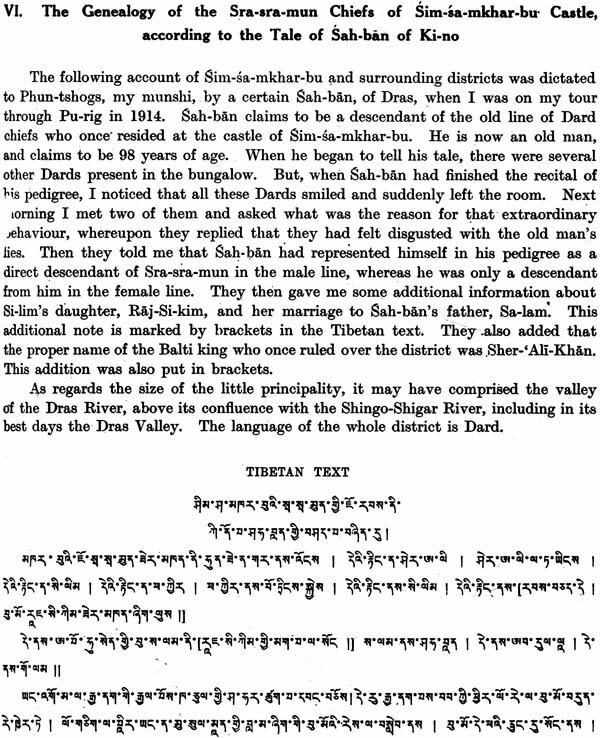 D. Barnett that the British Museum was in possession of a Ms. of the La-dvags-rgyal –rabs, I asked Dr. J. Ph. 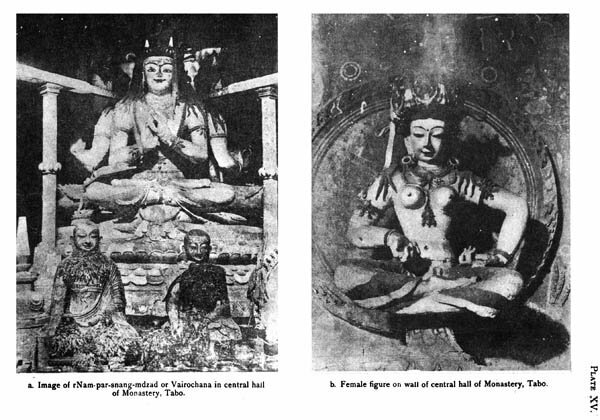 Vogel, then officiating Director-General of Archaeological, India, to allow me to order a photographic copy of the same, to which he kindly agreed. 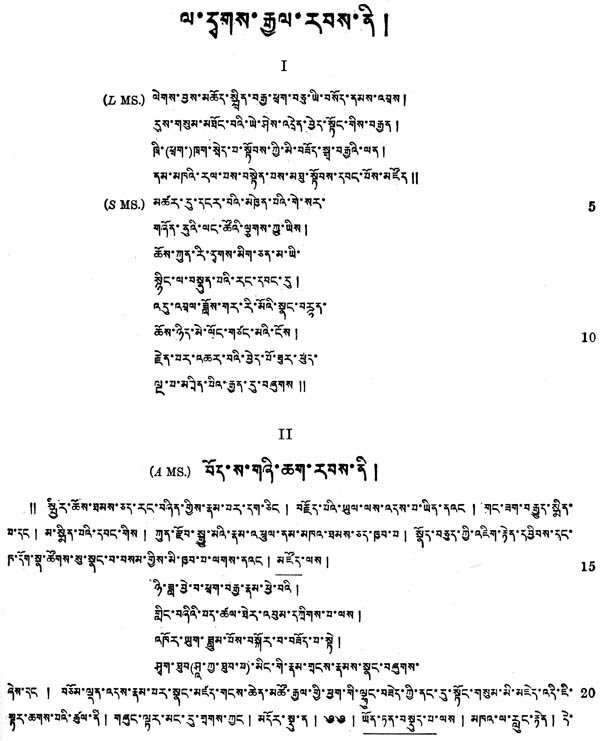 In the present publication the Tibetan text of the following chapters appears for the first time:-chapter ii, on cosmology ; chapter viii, on the kings from Bde-ldean-rnam-rgyal down to the Dogra wars (c. 1625-1834 A. D.) ; chapter x, on the history of Ladakh after the Dogra wars ; and chapter xi, containing chronological and taxation tables. 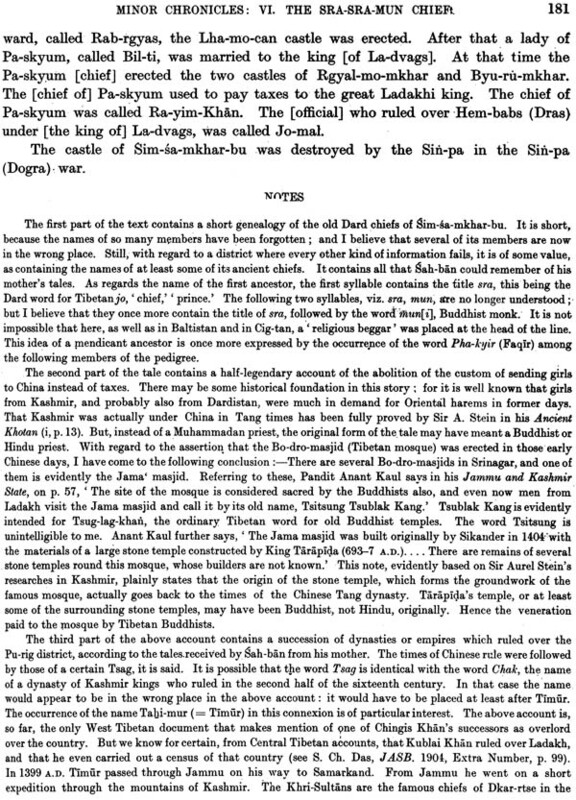 With regard to chapter ix, the history of the Dogra wars, let me state that in the present publication the text of Ca MS. has been replaced by that of Cc MS., because the latter MS. contains not only a fuller, but also a more reliable account of those wars. Moreover, the text of the other chapters, which is mainly reproduced from former publications by Schlagintweit and Marx, has been carefully revised, and compared with that of the London MS.; and Thus a number of doubtful readings have become clear. 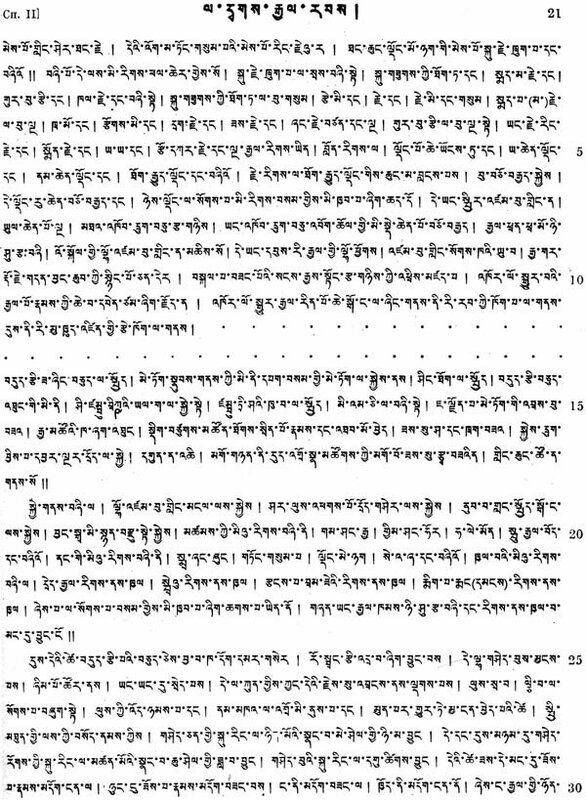 As regards translation, the following chapters only contain entirely new material :-chapter ii, on cosmology ; chapter x, on the history of Ladakh after the Dogra wars ; and chapter xi, chapter xi, chorological and taxation tables. But here let me state that my revision of the former translation by Schlagintweit and Marx has in a great number of cases led to entirely new conceptions. And the present revised translation yields a richer harvest of historical facts than could be gathered from the former translations. Let me now describe the five MSS. Which have supplied the basis of the present text. I have not seen the original of a single MS.; but a comparison of the different copies with one another has shown me their reliability. Of the London MS. I had a photographic reproduction.